Hello! It's time for the August Taylored Expressions Baker's Dozen Studio Challenge. This is a monthly opportunity for us to share what makes our stamping studios hum. Each month we have a fun, crafty question so we can share our favorites, some tips and tricks, stamping advice and more. The Sky's the Limit! 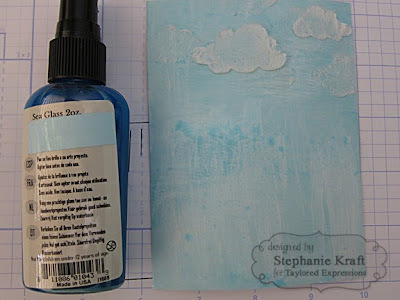 There are so many ways to create sky backgrounds for our cards and projects. So often, our blog readers are left staring at a beautiful sky and asking "How'd she do that?". Show us one of your favorite ways to create a pretty sky background and make sure we know how to recreate it! 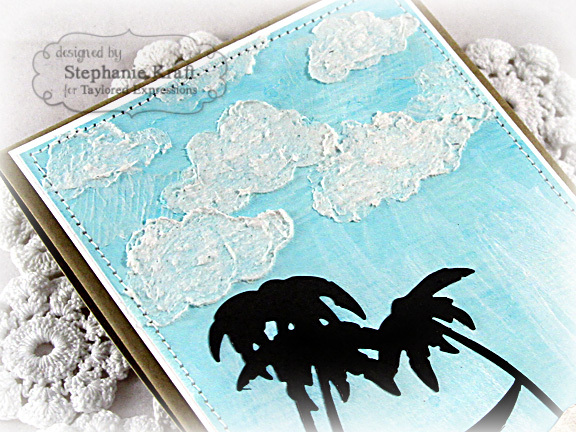 Typically, when I create a sky background, I use the Cloud Border die and either sponge or stipple my clouds. This is by far my go-to method. I've been in a little creative funk lately, so I decided to try something different. I attempted to create a mixed media sky background for my card today. 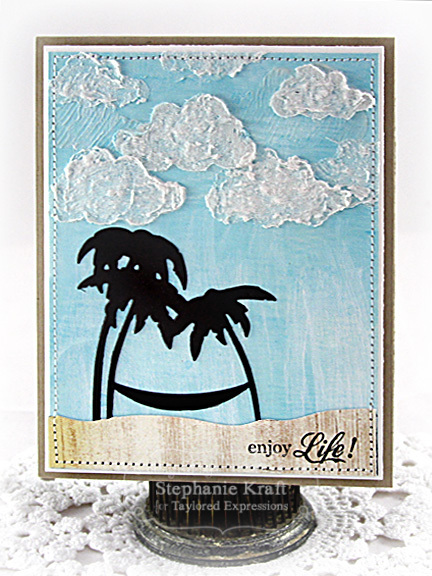 I used part of the Beach Border die (palm trees and hammock) and the sentiment is from Hangin' Out - At the Beach. I didn't want to cover up my entire background, so I kept this fairly clean & simple. Here's a little step-by-step on how I created my background. 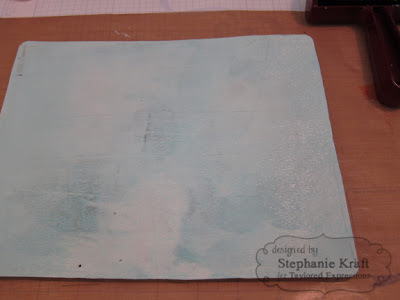 First I started with a Gelli Arts 8x10 printing plate and a few different colors of acrylic paint. I brayered on the paints then pressed Choice Snow White cardstock directly on to create my patterned paper. Some times I use white cardstock, some times watercolor or mixed media paper. You can pretty much use whatever you'd like - the results vary depending on the type of paper you use as different types of papers receive the paint differently. 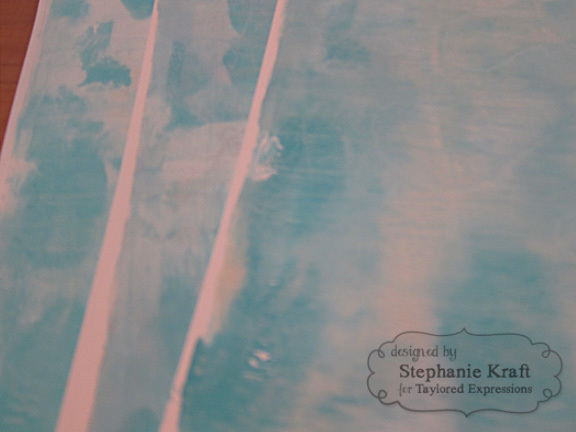 I kept pressing cardstock onto the printing plate until all of the paint was gone/dried up. The process is very simple: 1) press cardstock down to get an imprint, 2) use brayer to redistribute paint, 3) repeat until paint is dried up. I was able to get 3 prints. Notice that each sheet is unique. 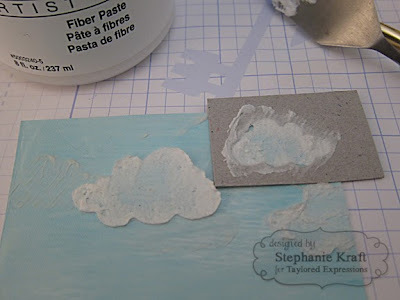 I took one of the sheets of paper of that I'd just created, cut it to the size I wanted for my card, then I started adding clouds using molding paste. 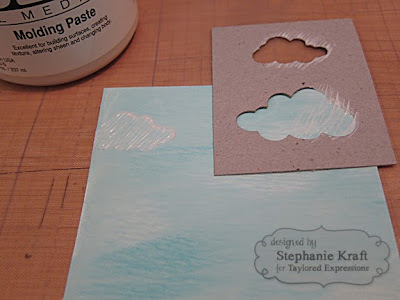 To create my cloud "stencils", I used the Cloud Duo die. I kept adding clouds, letting each layer dry in between. Next, I wanted to apply a bit more texture, so I randomly added more clouds around and over my molding paste clouds. This time I used fiber paste. Again I had to wait between applications to let each layer dry, then I added more clouds until I was satisfied with end result. I wanted to have a little more "artsy" look to my background, so I painted some gesso around the clouds and in the lower sky. I also spritzed on some Sea Glass glimmer mist before the gesso dried. The result was some random streaking as well as sparkle & shine (which unfortunately doesn't show in the photos). Accessories: Taylored Dies: Beach Border, Cloud Duo (TE); Gel printing plate (Gelli Arts), Paint (Martha Stewart), Gesso, Molding paste, Fiber paste, Sea glass glimmer mist (Tattered Angels), Foam tape, Thread, Sewing machine. WOW Stephanie...your clouds look incredible!!!!! They look so light and airy....love this awesome cloud technique!!!!! Whoa, Stephanie...you rock Mixed Media! I'm glad you showed the step by step because I wouldn't have known how you got that awesome look otherwise! How cool are those clouds!!! 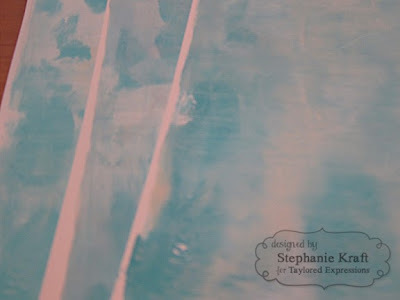 I just love what you created here, Steph!! Just gorgeous!